San Martino in Grania is a name of few houses village in the nothing of Crete Senesi, the land of lonely threes. No shadow for these hills, fully open to the winds and the sun, the Crete are located south-east by Siena, just below the Chianti area, which is north-east by the Tuscan town. San Martino is just few houses but give the name to the country road passing through the Crete, a 10 km gravel road that has been choose by RCS as new dirty sector in the next edition of the Strade Bianche. It was first approached by the women last year, during the first edition of women race and the organizers immediately realized it perfectly fit to introduce the key part of the race: Monte Sante Marie, the 11,5 km dirty road twisting and rollercoasting above Crete hills that always select the group of the best, with just 20-30 riders. San Martino in Grania itself could be enough to have a good selection, especially for its final climb, which is 4-5 km long, and especially for last kilometer of road, which includes several switchbacks before coming back on the paved road, which will head to Asciano and Monte Sante Marie. On the top of it, the race is still 63 km to the finish, the right length to make the selection and proceed in a small selected group of fellow. Last year the women went on the top of San Martino with 10 riders left on the front and at the finish we may find 9 of them packed in a minute, all the other at more then 4 minutes: what does it mean? Simply that San Martino allowed the great selection of the best and the remaining part of the race (not including Sante Marie) has done the rest. The dirty road start in Monteroni d’Arbia, a town located south to Siena on the via Cassia, the way to Rome. The first part of the road is flat and straight but after 1 km comes in sight of a hill; it’s just a short climb, followed by a short steep descent, it cross a creek and twist right and then left: just over there, after 4 kilometers of gravel, start the climb. 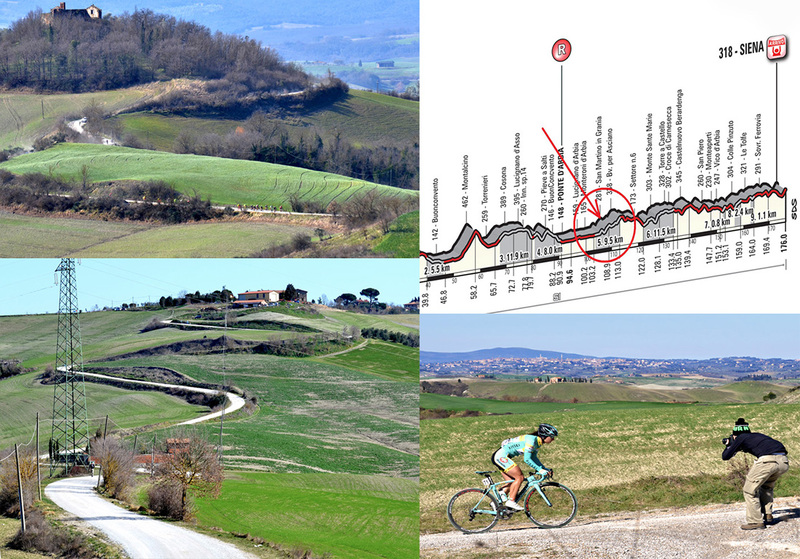 First passing the few houses of San Martino in Grania, then penetrating the grain fields till the top of the hill and finally twisting on the ridge of them till the last kilometer of the climb, the hardest, the most spectacular. The pavement surface may be rated overall from good to very good. The main issue may be some grit accumulation in the short descent, but this is very common on “strade bianche” and is one of the first reason why the selection start to take place on the descents (even more true on Sante Marie sector). The climbs are significantly hard and the group becomes long, so that on the top of the hills (these climbs are quite shorts) all are riders are still there, but in single file, during the descent any esitation (and really it’s hard to avoid any of them) becomes a gap at the bottom of it, where the new climb start again. This becomes the main reason of selection at Strade Bianche. On the top of San Martino in Grania you may already see Siena. It’s over there, on your left, it’s obviously her, ‘cause you have already in sight the Mangia’s Tower, it’s obviously her, ‘cause it’s so beauty. Between you and her, the nothing of the Crete, the lonely trees land. But for riders there are still 63 km to go, and the most hard sector of grave, the Monte Sante Marie, included in the race since the very first edition in 2007. Will be sunny? Will be windy? Cloudy or rainy? I don’t care; I just care of the smell in the air, which is already bringing the promise of the spring. Now it’s too late, the gravel waits since too long and is anxious to wake up. It’s the sound of the wheel on the grit, or the chain rhythmically jumping? I don’t know, I don’t care. But it’s coming.